FORT MYERS, Fla. — Senior right fielder Sam Gardner (Curwensville) collected seven hits in four consecutive games during Pitt Bradford’s 4-3 spring break trip to the Gene Cusic Classic last week. His average soared from .250 to .357, tops among the Panther regulars. Gardner was hitless in the tourney opener, a 1-0 win over Muskingum (Ohio), but scored the only run on a two-out error in the eighth inning after being hit by a pitch. He socked a two-run double, singled and scored three runs when the Panthers drubbed Finlandia (Mich.) 17-2 in the first game of Wednesday’s twinbill and added a single in the 2-0 nightcap win. On Friday at Terry Park, Gardner keyed an 8-2 victory over nationally-ranked Johns Hopkins with a two-run single that put the Panthers ahead 3-2 in the bottom of the fourth inning and a run-scoring single in their four-run fifth. Johns Hopkins, No. 18 in last week’s D3baseball.com Top 25 Poll, came back to end Pitt-Bradford’s seven-game win streak 7-2, but couldn’t cool off Gardner, who singled and doubled. Gettysburg pitchers did, though, in a 3-2, 12-4 sweep at the Red Sox Player Development Complex Saturday that sent Pitt-Bradford home with an 8-4 record. Gardner, who drew two walks in the second game, is 10-for-29 and tied for second on the team with nine RBIs. He’s also second in on-base average at .471. FORT PIERCE, Fla. — Senior Chad Zurat (Clearfield) was 1-1 in his two starts for Penn State Behrend (6-4) last week as the Lions won five games in a row before losing the finale of their spring break trip. In only the third start of his four-year career on Monday, March 9, Zurat worked six innings in a 6-2 victory over Arcadia at the Lawnwood Complex. The right-hander gave up six hits and two earned runs with one strikeout and two walks. Zurat got the nod Saturday against St. Scholastic (Minn.) and was tagged with the loss as the Lions dropped their getaway game 7-2. He whiffed six and allowed only three hits and one free pass in 5.1 innings but surrendered five runs, all earned. His earned run average is 5.68 and his strikeout-walk ratio is 8-3 for 12.2 innings in three appearances. ABERDEEN, Md. 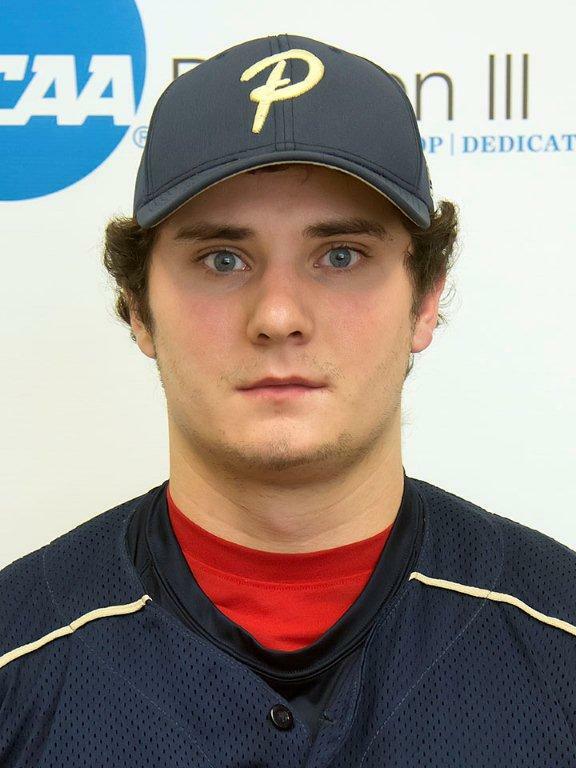 — Junior second baseman Derek Danver (Clearfield) had one hit in six at-bats as Clarion (2-2) began its spring break trip with a split against East Stroudsburg (10-3) at the Ripken Complex Friday. He walked and scored a run in Clarion’s 9-5 win after East Stroudsburg, ranked No. 20 in last week’s National Collegiate Baseball Writers Association NCAA Division II Poll, took the opener 11-2. WINTER HAVEN, Fla. — Freshman right-hander Kurtis Krise (Woodland/Clearfield Area H.S.) pitched three innings with a no decision for Penn State Altoona in a 14-7 win against Wittenberg (Ohio) at Chain of Lakes Park Tuesday, March 11. Krise surrendered six hits and four earned runs while striking out three, walking two and hitting one batsman in his first start for the 3-9 Lions, who took him off the hook with seven runs in the fifth inning. In his first appearance Saturday, March 8, Krise closed out a 16-7 victory over Penn State Abington by retiring two batters with one runner aboard. MYRTLE BEACH, S.C. — Freshman pitcher Heather Picard (Clearfield) suffered one loss in her first two starts for Mount Aloysius but bounced back with two solid performances for victories to help the Mounties finish in the middle of the pack of the Snowbird Invitational at 4-4 last week. Her best outing came on the final day of the spring break trip, a route-going 8-3 win over SUNY Institute of Technology (2-6) at the Grand Park Athletic Complex in which she scattered eight hits, struck out 10 and did not allow an earned run, lowering her earned run average to 2.25. Picard logged her first win the previous day, holding Delaware Valley (1-7) to four hits and three runs, one earned, through five innings of a 9-3 victory. The 5-9 right-hander struck out two and walked four. On Tuesday, Picard kept the Mounties close in their 4-3 loss to Bridgewater (Va.), which was 8-0 in the tourney for an 8-2 record. She pitched three innings with three strikeouts and no walks, giving up four hits and one earned run. Picard’s debut came in an 8-0 Mercy Rule loss to 4-6 Ursinus on March 10. She hurled 3.2 innings and was charged with four earned runs while fanning four and walking none. During fall ball competition, Picard impressed Mount Aloysius coach Carl Teeter in a 1-0 loss to Penn State Altoona by firing a three-hitter against the defending Allegheny Mountain Collegiate Conference champions. “What she did was amazing against their lineup,” the seventh-year coach said for the season preview posted on the Mountie website.